Does the Bay Area Have the Best Quality of Life -- Or the Worst? 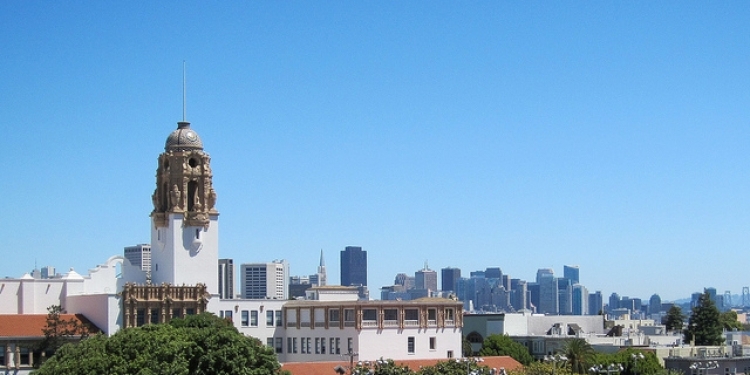 San Francisco's Mission High School bordering Dolores Park. Photo by flickr user DB's Travels. When you live in San Francisco, it can be easy to forget that your standard of living is not the norm for all Californians. Not everyone in our state has such easy access to the Pacific Ocean, cascading mountains, iconic skylines and Blue Bottle Coffee. A new report has attempted to quanify California's quality of life by ranking groupings of neighborhoods on education, health, and living standards. On May 17, The American Human Development Project released A Portrait of California. Of all fifty states, California ranks 12th in terms of human development, with a score of 5.46 - above the 5.17 national average. But even though California is above the national average on all three human development indictaors (education, health, and living standards), our state still faces a number of issues concerning the quality of life for its residents. For example, despite ranking in the top 75th percentile overall, California has the greatest range of scores between congressional districts. And California is thied from last in high graduation rates, in front of Mississippi and Texas. Where does our region stand in terms of human development? According to the report, the Bay Area tops the list for all three human development indicators. Of the 233 census neighborhood groups studied, 11 of the top 20 are located in the Bay Area. Of these 11 groups, one falls within the city of San Francisco’s borders, containing the Marina, Chinatown, and North Beach neighborhoods. To no surprise, the Bay Area residents living the highest quality of life — with an HD score of 9.35 — can be found in the heart of Silicon Valley, in cities such as Los Altos, Mountain View, and Palo Alto. The report refers to this area as the "Silicon Valley Shangri-La." However it’s not all good news for the Bay Area: Oakland’s Elmhurst neighborhood falls in the bottom twenty, with a human development score of 3.07. The lowest ranking San Francisco neighborhood group is Hunter’s Point and McLaren Park, with an HD score of 4.99. While the Bay Area is an extremely prosperous region, more steps must be taken to improve the quality of life for those living in areas with low human development scores. The report outlines a number of ways to improve human development scores for all of California, which the Bay Area can apply to itself as a region. For example, access to education and jobs should be more evenly distributed and the gap between the haves and the have-nots must shrink, not continue to widen. We must direct attention to areas of concern, not bask in the areas that are thriving, and come together as region to address these serious problems. California life expectancy ranges from 88.1 years in Orange County’s Newport Beach and Laguna Hills to 72.8 years in Watts. Only 8 out of every 100 African American ninth graders make it into a four-year California public college. In California, there are an average of 90 public school staff members per 1,000 students. This ranks 50th in the nation compared to the national average of 124.7 public school staff members per 1,000 students. The report concludes that if every California adult obtained a high school diploma, 317,216 fewer adults would be obese and the state would have 51,081 fewer prisoners.